Department of Radiodiagnosis has been playing an important role in early diagnosis of Cancer and other non - cancerous diseases. 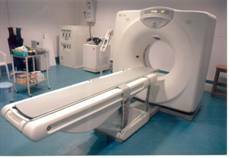 It is equipped with modem CT scanner, MRI, and U.S.G. Colour Doppler, Mammography, Portable Ultra Sonography, 300 MA X- ray unit and two mobile X-ray units. Addition of latest high resolution multi slice (16 slice) C.T. Scanner, Portable Colour Doppler, Digital X-ray system this year makes Radiodiagnosis department in this area modern to provide many imaging techniques like 3D reconstruction (useful for cancerous patients and orthopedic purposes), virtual bronchoscopy and colonscopy, non - invasive whole body angiography and non - invasive coronary angiography under one roof with assured image quality and diagnosis. Portable Ultra Sonography and Doppler is a useful tool for bed - ridden patients and provide bed side services. Department is also engaged in complicated interventional imaging guided procedures VIZ. CT and USG - guided FNAC, fluid and abscess drainage, USG - guided PTBD and nephrostomy. Department of Radiodiagnosis does nearly 200 radiographs, special investigations including barium studies, minimum of 50 ultrasound case; 5-7 mammograms, with sono mammography correlation, 3-5 ultrasound neck and scrotum cases,1-2 Doppler cases as well as upto 10 - 15 ultrasound guided FNAC are done per day in the department. 15-20 CT scans are done per day as well as 5 – 7 CT RT planning is also done. 4-6 CT guided FNAC / Biopsy are performed on every alternate days. 15-20 CT / MRI scans done from outside institutions of Oncology cases are reviewed in the Department per day. The spiral CT Scan is available in the department on which entire range of diagnostic studies of the brain and rest of the body are performed. In addition to whole body CT imaging dual phase CT Scan of the liver, pancreas and vascular studies like spiral CT angiography of cerebral, carotid, abdominal, thoracic, and peripheral, vessels are performed with the help of pressure injector for accurate depiction of vessels without the need for any invasive procedure. Virtual colonoscopy, endoscopy and laryngoscopy are also done in our setup. High-resolution CT study for lungs and bony abnormalities like temporal bone are performed routinely.3D reconstruction of axial images by forming MPR and SSD is done in cases wherever required. Adequate quantity of contrast agent is given and thin sections are taken wherever required, so that image quality is maintained. The non-ionic contrast media is always used to ensure that no adverse reactions occur. Interventional procedures including diagnostic procedures like USG or CT Guided aspiration/ Biopsy are being performed routinely. Transvaginal biopsy of pelvic masses and transrectal biopsy of prostate are also performed. Therapeutic procedures like drainage of fluid collections or abscess and celiac plexus block are being performed. MRI facilities are provided in collaboration with leading centers of the city under smooth and prompt arrangement.